Author(s): Bindu Noolu, Ramesh Gogulothu, Mehrajuddin Bhat, Syed S.Y.H. Qadri, V. Sudhakar Reddy, G. Bhanuprakash Reddy, Ayesha Ismail. Department of Endocrinology & Metabolism, National Institute of Nutrition, Jamai Osmania, PO, Tarnaka, Hyderabad, India- 500007. Inhibition of the 26S proteasome is an attractive approach for anticancer therapy. Proteasome inhibitors are known to selectively target cancer cells and make them more sensitive to chemotherapeutic agents. Murraya koenigii is a medicinally important herb of Asian origin and a rich source of bioactive compounds such as flavonoids and alkaloids. In the present study, we investigated the proteasome inhibitory and apoptotic effect of M. koenigii leaf extract in vivo in a xenograft tumor mouse model, and also assessed the toxicity if any in normal mice. M. koenigii extract did not lead to any toxicity in mice. Analysis of extract revealed the presence of flavonoid compounds which act as proteasome inhibitors. Quercetin treatment led to the decrease in the cell viability and arrest of cells in G2/M phase. Quercetin, Apigenin, Kaempferol and Rutin; flavonoids present in the leaf extract, dose-dependently inhibited the endogenous 26S proteasome activity in MDA-MB-231 cells. Reduction in tumor growth was associated with a decrease in proteasomal enzyme activities in the treated groups. Increased caspase-3 activity and TUNEL-positive cells indicated enhanced apoptosis with Murraya leaf extract treatment. Decreased expression of angiogenic and anti-apoptotic gene markers is indicative of inhibition of angiogenesis and promotion of apoptosis in the leaf extract treated tumors. Keywords: Apoptosis, breast cancer, flavonoid, Murraya koenigii, proteasome, xenografts. Affiliation:Department of Endocrinology & Metabolism, National Institute of Nutrition, Jamai Osmania, PO, Tarnaka, Hyderabad, India- 500007. Keywords:Apoptosis, breast cancer, flavonoid, Murraya koenigii, proteasome, xenografts. Abstract:Inhibition of the 26S proteasome is an attractive approach for anticancer therapy. Proteasome inhibitors are known to selectively target cancer cells and make them more sensitive to chemotherapeutic agents. Murraya koenigii is a medicinally important herb of Asian origin and a rich source of bioactive compounds such as flavonoids and alkaloids. In the present study, we investigated the proteasome inhibitory and apoptotic effect of M. koenigii leaf extract in vivo in a xenograft tumor mouse model, and also assessed the toxicity if any in normal mice. M. koenigii extract did not lead to any toxicity in mice. Analysis of extract revealed the presence of flavonoid compounds which act as proteasome inhibitors. Quercetin treatment led to the decrease in the cell viability and arrest of cells in G2/M phase. Quercetin, Apigenin, Kaempferol and Rutin; flavonoids present in the leaf extract, dose-dependently inhibited the endogenous 26S proteasome activity in MDA-MB-231 cells. Reduction in tumor growth was associated with a decrease in proteasomal enzyme activities in the treated groups. Increased caspase-3 activity and TUNEL-positive cells indicated enhanced apoptosis with Murraya leaf extract treatment. 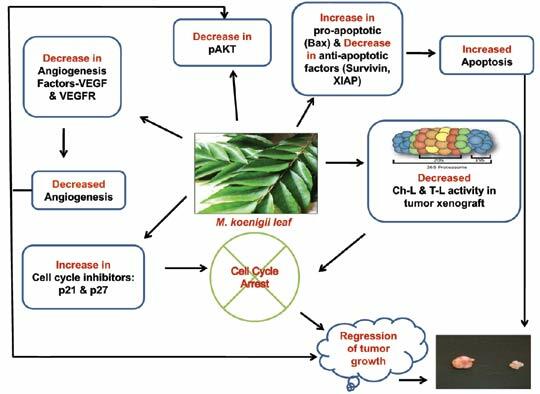 Decreased expression of angiogenic and anti-apoptotic gene markers is indicative of inhibition of angiogenesis and promotion of apoptosis in the leaf extract treated tumors.